An amazing combo of charme, culture, delicious food and wine in the most iconic region of Italy: Tuscany! 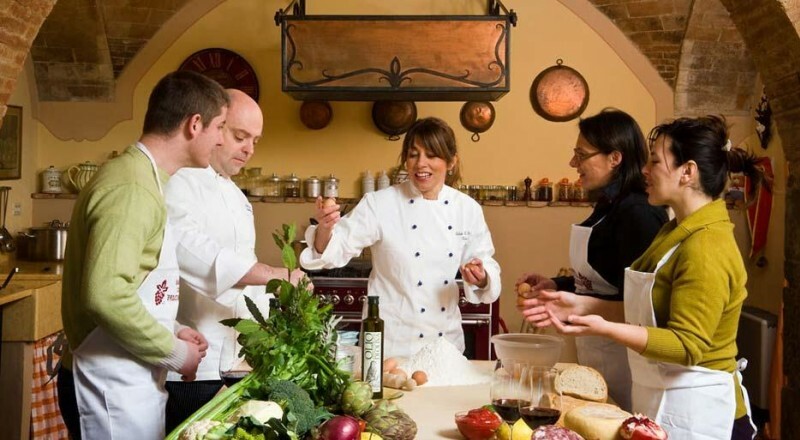 Enjoy our Tuscany Escape including One Day Cookery Course and Wine Tasting in a wonderful countryhouse in San Gimignano. The Leaning Tower of Pisa has made it famous throughout the world. During your full day you will admire the Square of Miracles, the unique composition of the Cathedral, the Leaning Tower, Baptistery and Campo Santo. The Cathedral of Santa Maria Assunta is a masterpiece of the italian Architecture. Inside the Baptistery you can visit the hexagonal pulpit by Nicola Pisano. Something very special in its own way is the Cemetery in the form of a monumental cloister. Visit Lucca and visit this beautiful medieval city with the Guinigi Tower and the Clock Tower. From these points there is a splendid view over the rooftops of the Tuscan town, an overview that allows you to appreciate the beauty and harmony, and find the same urban structure built by the Romans. Piazza of the Amphitheatre, in the name of what was already said in this space occupied today by one of the most beautiful squares in Italy. The Church of San Michele, also called the Forum, is a place where there was the center of the ancient Lucca. Today you will dive into the well-largest art capital of the world: Florence. One third of all art treasures of Italy is located in the Tuscan capital. Santa Croce, the largest Franciscan church in Italy, is considered the burial of important Italian personalities from history, art and literature. Equally impressive is the Palazzo Vecchio in Piazza della Signoria with the replica of David by Michelangelo. Additional points of interest include, without limitation the octagonal the patron saint of Florence Baptistery dedicated to San Giovanni and the Palazzo Medici-Riccardi, the first palace of the early Renaissance in Florence. Highly recommended would be of course the visit to the Uffizi Gallery, the world famous art gallery with paintings of the European Paintings of the 13th / 18th centuries. After heading into the Chianti area, which extends between Siena and Florence, that has spawned one of the most famous wines, the Chianti. Let yourself be enchanted by one of the most magnificent landscapes of hills, fields, numerous vineyards and olive groves. You will learn San Gimignano, whose soaring towers that can already be seen from afar. Worth seeing are the Basilica of Santa Maria Assunta, the Palazzo del Popolo with the Museum Civico and the Piazza della Cisterna with its pretty fountain. The town of Monteriggioni in the province of Siena was founded in the 13th century. Situated on a small hill, the medieval town center is enclosed from a quick 600-meter wall. Even when approaching, this imposing masonry is visible from afar. Monteriggioni is one of the best preserved medieval city centers in the country. Here you have easy feel to be offset Worden into pretty houses and narrow alleys characterize the city of Monteriggioni. Today´s impressions are shaped by narrow streets and tall towers and palaces. The medieval city of Siena is a work of art of the Gothic period. With its winding old town and the narrow, red-brown of high palaces brick of Sienese clay-lined streets, it seems as if the clock of centuries stopped. The historic center on its three hills grouped in the form of a three-star, is famous for its Palazzo Pubblico and its Torre del Mangia (88 meters high). From here you have a wonderful view of the famous beautiful Piazza del Campo. After breakfast drive to Montalcino, in the world famous because of its excellent wine "Brunello". The town is of Etruscan origin and was for a long time from Florence and Siena contended. In the afternoon visit to Montepulciano, situated on a high tufa plateau, known for its wine "Vino Nobile of Montepulciano". Drive to Pienza, a splendid jewel of the early Renaissance. Its name comes from Pope Pius II., who wanted to transform his birthplace Corsignano in an art jewel, after the election to the papacy. Numerous monuments are worthy of admiration, such as the Palazzo Piccolomini and the Cathedral. Today you will learn the 500 Mt. hilltop Etruscan town of Volterra. From the Etruscan and Roman past, Volterra tell parts of the city wall with a gate (4th / 3rd. Century A.C.), As well as the remains of the Roman amphitheater. Interesting are the Duomo and the Priori Square, with the Episcopal Palace, the Pretorio Palace with the tower of Podestà, the apse of the Basilica. Not to be missed in the town of alabaster, the collection of Etruscan urns in alabaster. Visit the beautiful city of Certaldo a small gem, easily reached by a funicular from the lower city. Everything is very well preserved and you can enjoy a wonderful view. Don’t’ forget to visit the House of Boccaccio and the cathedral.